Me and my Hungarian friends and co-workers from the Budapest learning center of EuNC. This past Thursday I travelled to the town of Gelnhausen, Germany for a gathering of the faculty of European Nazarene College. I was invited there to represent the school he teaches at in Budapest, which is a learning center of EuNC (think of it as an extension campus but without the campus!). 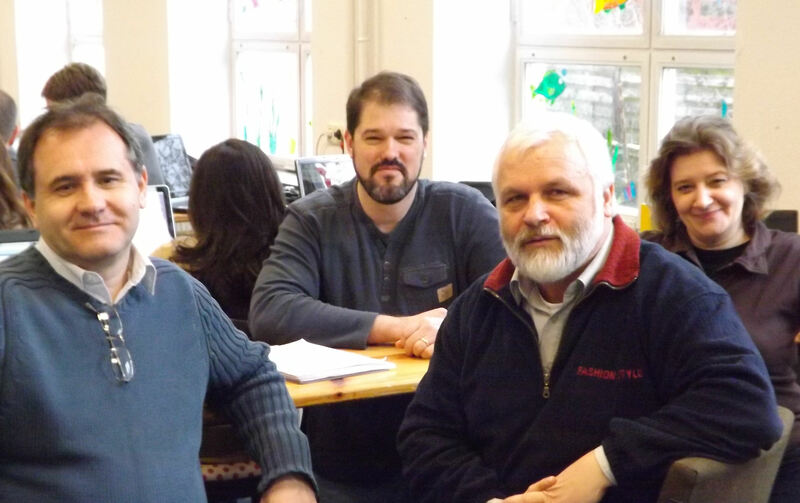 Also representing the Budapest learning center were (left to right) Imre Gusztin, Gábor Szuhánsky, and Mária Gusztin. It’s the third year I’ve been to these meetings and I always enjoy the interaction with my Hungarian co-workers from our learning center. I also enjoy meeting other faculty members from across Eastern and Western Europe. The picturesque town of Gelnhausen, Germany has been recognized as the geographical center of the European Union since the most recent expansion in 2007. Sometimes it helps when the work seems overwhelming to remember that we are not alone here. We are blessed by the encouragement of our co-laborers in Christ from many other churches and organizations who all share the same calling here in Europe: to proclaim Christ and make Him known among the nations – whether in Hungary or at the very center of the European Union!